The book looks at the history of knitting and how the process has evolved to the latest developments. 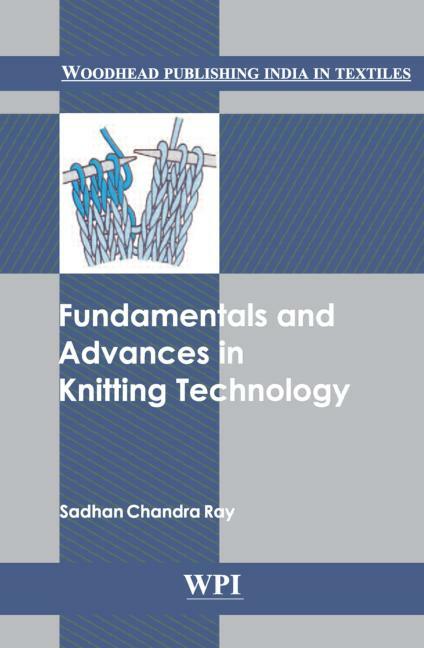 The chapters discuss the principles involved in all types of knitting machines and the different types of loops and knitted structures. The science and quality aspects of knitting, calculations related to knitting, and the mechanics of knitting are also examined. Knitting at a glance. Classification of knitting. Weft knitting elements and loop formation. General Terms in weft knitting. Basic weft knitting structures. Some special terms and techniques. Circular weft knitting machines and mechanism. Design and design elements. Flat bed knitting. Some aspects of weft-knitting sciences. Quality aspects in knitting. Warp knitting machines and knitting elements. Principles of loop formation in warp knitting. Warp-knitted stitches and structures. Double needle bar warp knitting machines. Some aspects of warp knitting science. Development in knitting. Yarn and its selection for knitting. Application of electronics in knitting. Yarn tension in knitting and its measurements. Mechanics of loop formation in weft knitting. Mechanics and mechanisms of warp loop formation. Knitting related calculations. Production of spacer fabrics in knitting. Scope of knitting in garment manufacturing. Analysis and testing of knitted fabrics. Scope of knitting in the manufacture of medical textiles. Concept of green business in knitting and knitwear industries.